The harpist currently purchasing a lever harp should keep the Bounty Program in mind for the future. Lyon & Healy or Salvi will apply the original purchase price of any Lyon & Healy or Salvi lever harp that is less than five years old, in fair condition and traded in by the original owner, toward the purchase of any new Lyon & Healy or Salvi pedal harp of greater value. Under the Bounty Program, one trade-in per customer is allowed. The Silhouette electric and Egan eletroacoustic lever harps are not included. Other conditions apply, contact us or your harp dealer today for details. 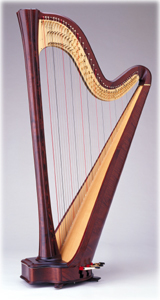 Please have your harp’s serial number and model information readily available. 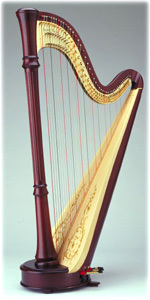 The Harp Connection may be able to take your harp in trade towards the purchase of an in-stock instrument. To be eligible for trade-in your harp must be in very good condition and will be inspected by one of our Certified Harp Technicians. Please contact us directly if you are interested in trading harps! This offer is contingent upon the eligibility requirements given above plus your trade-in harp being returned to us in extremely good condition, plus you must have a valid original bill of sale. If any cleaning, dusting, polishing, finish repairs or lever adjustments are needed, or if any broken strings need to be replaced, charges for those repairs will apply against your trade-in value. Additionally, if the strings on the harp are more than two years old, the strings will need to be changed before the harp is accepted for trade-in. Any shipping charges for the lever or pedal harp are paid by the customer and are not included in this trade-in program. The lever harp must be returned to the Lyon & Healy factory in Chicago or the Salvi depot in California (depending on model) to qualify for this program. These trade-in programs are subject to change at any time and other conditions may apply; please call us for current information.